Nest is the company that brought "Apple-influenced design" to thermostats by creating a beautiful, super-advanced yet super-simple device. The Nest shipped less than a year ago and the company has already unveiled it's successor: a sleeker, more advanced update of the original. 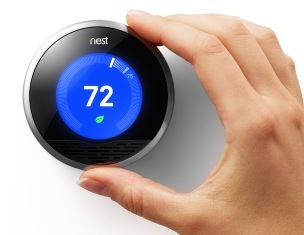 The Nest thermostat includes wireless network connectivity which allows it to be viewed and controlled remotely via a web browser or smartphone app. This is "version 2.0" of the hardware and "version 3.0" of the software (existing Nest owners get an over-the-air software update -- See? Told you it was advanced...) A history of temperature readings and HVAC activity is kept for review. The device has a motion sensor so it can distinguish between "active" hours (when people are home and moving about) from other times and adjust temperature settings accordingly. The device learns over time and provides reports on how well it's doing. Heads of households take note: you can even lock the device with a PIN code to keep others from changing the thermostat settings. Nice! Considering the device's $250 price tag, though, there are a few things Nest still needs to take care of. 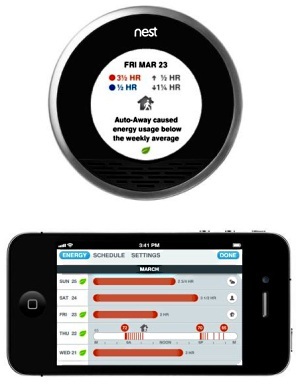 One of the most distinguishing Nest features is remote monitoring and remote settings adjustment. These days "remote" = "mobile device" and the Nest team has you covered: native apps for iPhone and Android as well as a "Control Your Nest" interface via the Nest website. Perfect, right? Yes, there is a native Android app. That app, however, has refused to run on many "non-standard resolutions" which appears to translate to most Android tablets. Rather than simply run on a portion of the larger screen as many non-tablet Android apps do, the Nest app refused to run at all. The issues are not relegated to just tablets, though, as the app often crashes when switching from portrait to landscape mode -- a real problem considering some of the app features can only be accessed in landscape mode. Good news, Nest owners! In conjunction with the "2.0" hardware release, the "3.0" software release coincides with an updated Android app that now supports a wide range of tablets. Time will tell if all the major bugs have been addressed but for the moment we'll consider Step 1 to be "accomplished". Side note: Nest does not allow Android devices to access website-based Nest controls but instead forces Android users to a "download our app" link. Smartphone users really should be given the option to use the website or download the app, not just one or the other. The workaround is to install a web browser like Dolphin or FireFox and use the "view as desktop" option (this hides the fact that you are running Android). Some of the most whiz-bang Nest features are "Auto-Schedule" and "Auto-Away". "Auto-Schedule" is a learning feature that tries to determine patterns of activity and temperature settings and then, on its own, predict when and to what degree your home needs to be heated/cooled without you having to program anything. "Auto-Away" attempts to determine when you are away from home and won't mind the thermostat adjusting itself to more conservative (power saving) settings. 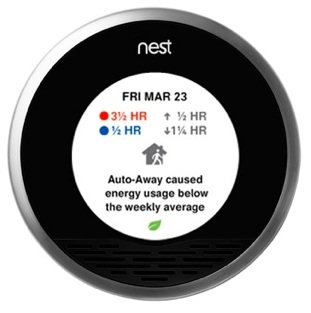 These are excellent ideas but, to date, a large number of Nest owners have reported odd and unpredictable behavior when using these features. Many owners have reported giving up and simply turning those features off. Fortunately Nest has been very active in refining the device software and routinely pushing out updates -- a total of twelve updates in the first twelve months, in fact. Here's hoping that the new "3.0" version of software with "Improved Auto-Away" and "Improved Auto-Schedule" resolves many of the quirky issues reported with earlier versions. If Nest is constantly watching and recording instances where it detects motion then why doesn't it provide a way to see that history via the mobile apps? More specifically, I'd like the option to have my mobile device routinely "check in" with my Nest and alert me when I'm away from home and the Nest detects motion. Perhaps the #1 complaint regarding "Auto-Schedule" is the fact that learned schedules treat thermostat temp change times as "start" times rather than "target" times. That is, if the Nest determines that you start moving around the house each morning at 6:00 AM and you raise the thermostat to 68-degrees at the same time, after a week or two Nest will begin doing the same action automatically at 6:00 AM without you having to manually change the setting. This is fine but what people *really* want is the option to have Nest treat 6:00 AM as a target time rather than a start time. That is, Nest should begin pre-heating at some earlier point so the house reaches 68-degrees at 6:00 AM. It's a little amazing that this option isn't already in place because Nest already tracks how long it takes a house to warm or cool. Perhaps the "Improved Auto-Schedule" feature in the new 3.0 software release will address this. Back to the smartphone apps: where is the "smart" option that alerts Nest to begin heating/cooling my home when I'm on my way home at an unexpected hour? If I work many miles away from my home and if I have the same commute pattern and if my phone has GPS (what smartphone doesn't?) then I'd like the option for my smartphone app to "phone home" and warn Nest that I appear to be en route. Read more about Nest's latest product release here. However, if you only take the time to read one more thing about Nest you should spend it watching this Nest user-created movie trailer and the accompanying mini movie.